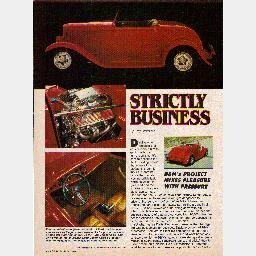 Here is a 4 page magazine article that appeared in a 1986 issue of HOT ROD Magazine. SUBJECT: Jim McCashin's gennie FORD 427 SC Cobra Roadster ragtop - built for the street-rod market. The article is in very good condition, light tanning of the paper around the edges. Shipping is by USPS Priority Mail in cardboard protected envelope.